The species has experienced a drastic population decline in the last 30 to 40 years. In 2009 the it was considered as one of the 25 most endangered primates in the world. There are numerous threats to Hoolock Gibbon, including habitat encroachment, forest fragmentation, hunting for food and traditional medicine, and capture for the pet trade. Between 2007 and 2011 PRCF and partners conducted a national Hoolock Gibbon status review in Myanmar. The review provided species density estimates for the both the Eastern Hoolock and the Western Hoolock gibbons at 25 sites. 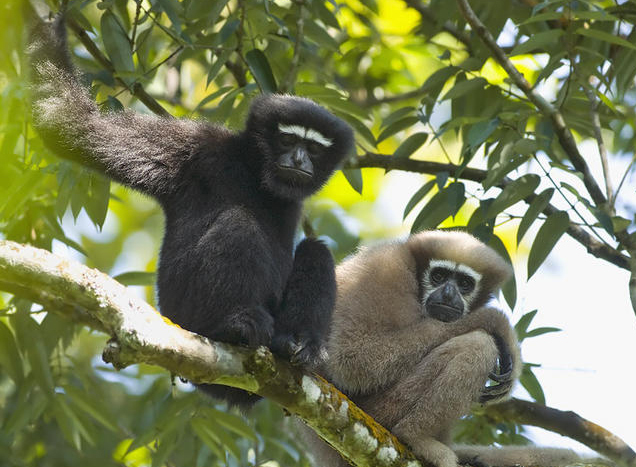 Survey results confirmed that the most significant remaining population of Hoolock is in Myanmar. Notwithstanding, the survival situation for Western Hoolock is less promising, as much of its former habitat is now degraded. Logging and hunting in existing gibbon habitat were shown to still be widespread, and that habitat destruction and fragmentation are the largest threat. The two species differ in their fur coloration and DNA sequences, and may have diverged about 1.42 million years ago. Sexes of both species have distinct white eyebrows, which are closer together in the Western Hoolock, making this the main visual diagnostic feature. The 2007-2011 status review indicates that the southern Rakhine State on the western Myanmar comprises the largest remaining global Hoolock Gibbon population. This information was harnessed by PRCF and partners to target several sites for direct conservation of the Western Hoolock Gibbon. A first site, in the Pauk Sa Mountain Landscape in northern Rakhine (= Arakan) Yoma, targets community-based conservation of the species in a non-protected are setting. The second location, at the Rakhine Yoma Elephant Range Sanctuary, works with both local communities and sanctuary officials to protect gibbon groups in the greater landscape, both inside and outside the sanctuary.